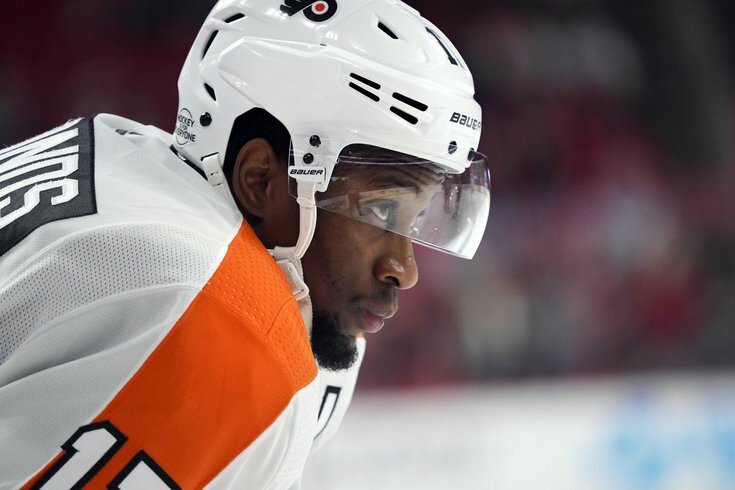 UPDATE [3:10 p.m.] — According to TSN's Pierre LeBrun, Wayne Simmonds is on his way to Nashville where he'll be reunited with former Flyers coach Peter Laviolette. In return, the Flyers got Ryan Hartman and a draft pick, per LeBrun. According to Craig Custance, it's a 2020 conditional fourth round pick, which is much lower than what the Flyers were reportedly hoping to fetch for Simmonds. Wayne Simmonds doesn't appear he'll be taking the ice for practice. This doesn't confirm a trade has been, or will be agreed upon — it could just be a precaution just in case. But it does show the Flyers are fielding offers at the very least. We'll keep you posted right here with our live stream/open thread below. The NHL's trade deadline is today. The Flyers, who won a remarkable Stadium Series game on Saturday to keep their season on life support are still likely to be sellers — with Wayne Simmonds the most likely player to be shipped off (though nearly every Flyers player not named Claude Giroux has been rumored to be on the block, including Shayne Gostisbehere and Nolan Patrick). There appears to be quite a large market for the "power forward," a 30-year-old winger who is having a down year but still is a really appealing piece for any team in a playoff race. Philly sits seven points behind the Hurricanes and Penguins for the last Wild Card spot, and are a point behind the Sabres — also chasing that spot. Perhaps ironically, the Flyers' first game after the 3 p.m. deadline is Buffalo Tuesday. There is always the chance the team makes the postseason, though buying at the deadline now would be an unwise business decision, especially with so much interest in Simmonds. Making the Playoffs as the lowest seed means a likely early exit, and the chance to help overhaul their line up with sights set on 2019-20 is the smart move. The best fans can hope for is for the team to stand pat. Or to get a good return. Bruins still have Wayne Simmonds as No. 1 object but it'll cost them first-rounder and a prospect. Will a team like the Bruins or Lightning step up and offer Philly a first rounder, and a prospect for Simmonds? Or does the high asking price mean they re content to stand pat after all? Will they move anyone else? Or will they stick with that they have and close their eyes and go for a playoff spot with 20 games left?